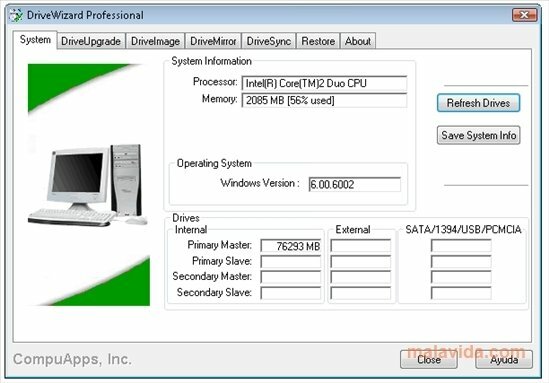 DriveWizard is a program with which it is possible to create backup copies and migrate data between computer's, using various kinds of supports, ranging from internal and external hard drives to optical discs. The main factors of this tool reside in its versatility, its many appealing functions, and its ease of use, because all the controls are visible and the configuration panels are rather intuitive. - Option to create complete backup copies without having to exit Windows. 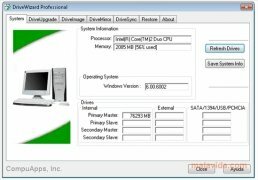 - Function to clone and update discs. - Automate the data saving processes. - Compatibility with internal drives (IDE and SATA), external (USB, Firewire, networks units or PCMCIA) and optical discs. 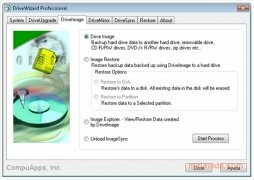 If you were looking for a versatile program that is as simple as possible to create complete or partial backup copies of any of your hard drives, you should take DriveWizard into account. The trial version can be used 30 days free of charge.